It is difficult being on the other side. Whether that’s on the other side of the world, watching the news of Egypt, where I was less than a month ago; or on the other side of the walls the army are building in a futile attempt to create a barrier between them and their own. But the wall in Mohammed Mahmoud came down. By the sheer strength of their anger, the depth of their frustrations, the unreasonableness of their oppression and by the roughness of their hardworking, but bare hands, the wall came down. Nothing surprising was on the other side of the wall – just a reaffirmation of different loyalties. No difference in creed, race or religion that has often caused the building of such walls – just a difference in “sides”. Honored to be taking side with the people, their numbers increased through the night, through daybreak, through the following day. The people torn between keeping their fight for freedom “Selmeya” (peaceful), constrained between the invisible lines of Tahrir Square, or not, they moved in their thousands towards the Ministry of Interior chanting, angry, demanding justice. Justice… a word whose flames have been repeatedly put out in Egypt by the suffocating hand of the law. SCAF are digging the hole they have sunk themselves in deeper and deeper with every statement they make after a tragedy that comes at their hands, whether directly or indirectly. As the mothers whose sons had gone to watch the football match stood outside the Ahly club hysterical, desperate to know if their children would be coming home that night, the Field Marshall was “deeply regretting” events (though I thought a prerequisite of regret was a decision not to repeat behaviour), and telling the nation that the victims will be considered amongst the revolutions injured and martyred (a direct confession of SCAF’s responsibility) and that their families will receive financial compensation (as if this is why they had gone to the match). The broken hearts that were watching the events were having salt rubbed into those wounds. SCAF’s insensitivity, lack of responsibility, blood and power hunger was breathing down the necks of those fighting for freedom, fighting for bread and fighting for human dignity. The Ministry of Interior and SCAF seem determined to prove they really are one hand – one hand against the people. A war of attrition that costs us, this side, much. A war of wills that no doubt the people will win. My heart breaks at the price of that victory, but my pride swells that I was once part of that world. I have faith in the side I’m taking. 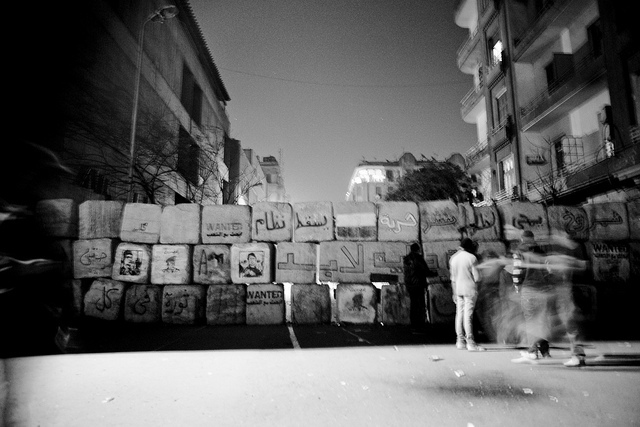 Police have just erected another concrete block wall on Mansur Street. I wonder what it is they hope to block out? The cracks in the wall betray betrayal and those on the other side can see through them, magnified by the hundreds, the corruption they stand there to protest. Those who give orders to protect the ministry are so far removed from the reality of the people’s demands. The people do not want to storm the ministry! They are protesting there because it is the police head quarters. It is there that over the years, the people who have held office have failed to protect the people. Not only failed to protect them but have often been the very cause of their torture and their abuse. What wall will keep the people away? In this war of attrition, in this war of wills, the will to freedom and the will to justice will win. On my side of the geographical wall, via twitter, I continue to watch my friends bravely take to the street, confused as to where to go, what to chant or who to trust. They take to the street to protect what they had planted there last January. They go to protect the lack of fear, to protect the fight, to protect the dreams. Dreams that water hoses could not drown, visions that tear gas could not smother and hopes that bullets could never kill. At last! Something clear I can unerdstand. Thanks!